You may recall the Litill Terrarium featured in the F&M a while back. 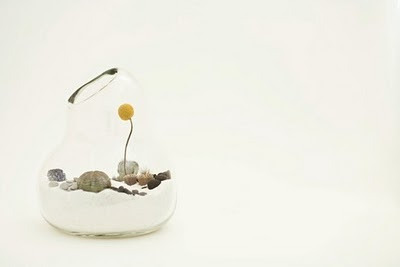 Mix the perfect amount of minimalism with some arrestingly odd hand blown glass containers and you get something akin to the beautiful Litill Terrariums by Lauren Coleman. The site is now alive and you too can own a piece of Dr. Seuss meets the planet Mars. Litill provides ample care instruction on how to manage the co-existence of the succulents and the tillandsia, which includes the removal of the tillandsia periodically to allow proper watering. I think it is a creative solution to allow these stunning arrangements and -as any terrarium owner can attest to- all terrarium plants require some maintenance and TLC now and then. You are the place to come for all things terrarium! Great site. I am a total novice at them so I don't expect much from that simple one I put together. Which, btw, the primula is not much caring for being under glass. I think it will be disbanded shortly.... Maybe I'll try again tho with some inspiration from your blog? Thanks too for your comment. Beautiful, but those cacti look really sickly. I can't imagine what that sand or mix is, but it won't sustain cacti. They can't live in sand. Maybe a mixture of perlite and pumice? Nonetheless, not good for the plants. I imagine, even with infrequent watering, it's going to turn green or discolor.